FILE - From left, Democratic presidential nominee Hillary Clinton in Philadelphia, and Republican nominee Donald Trump in New York City. As the southeastern state of Florida contends with the spread of the Zika virus, Democratic presidential candidate Hillary Clinton is proposing a new fund to improve the way the federal government responds to Zika and other public health emergencies. Florida officials announced Tuesday a case of Zika has been transmitted by mosquitoes in Florida’s Tampa Bay region, some 425 kilometers from Miami, where the first locally spread U.S. cases were discovered. Clinton's proposal calls for the establishment of a Public Health Rapid Response Fund, which would allow the president to quickly release funds in the event of a public health crisis without having to wait for congressional approval. Democratic presidential candidate Hillary Clinton speaks to medical professionals after taking a tour of Borinquen Health Care Center, in Miami, Florida, Aug. 9, 2016, to see how they are combatting Zika. Clinton's campaign did not specify how the program would be funded, but did say it would cost several billion dollars over a 10-year period. Bi-partisan legislation similar to Clinton's proposal has already been introduced by Senators Bill Cassidy (R) and Brian Schatz (D). 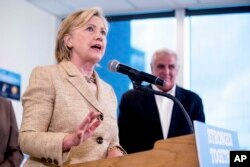 Last March Clinton unveiled a plan to combat the virus with the allocation of $1.8 billion in emergency funds. Republican presidential candidate Donald Trump seemed to agree with his rival that congress should provide funding for Zika. Earlier this month, Trump told the Miami Herald he would "let some of the funds that they're asking for come in" to combat the virus. If the Zika virus worsens, how the crisis is addressed could have political consequences for the candidates in Florida, the nation's largest battleground state with 29 electoral votes up for grabs. Polls indicated Trump recently trailed Clinton in Florida by a narrow margin, but a poll conducted by Monmouth University between August 12 and 15 showed Clinton with a commanding 48 to 39 percent lead. Trump will have an opportunity to address the Zika crisis when he attends a campaign rally in Tampa, Florida Wednesday afternoon. Later Wednesday, the real estate mogul will speak at a rally in the southern city of Jackson, Mississippi, a state where polls say Trump has a solid lead. The population of Jackson is 80 percent African American. And Jackson is the capital of Mississippi, which has the highest proportion of African Americans than any other state in the U.S.
Trump has reached out to African Americans in recent days after rejecting high profile opportunities to speak before groups such as the NAACP, the National Urban League and the National Association of Black Journalists, suggesting a change in strategy by his new campaign leadership. But the Republican presidential candidate has been criticized by some for issuing appeals to African Americans in predominately white communities. Trump initiated his outreach to African Americans last week in Washington County, Wisconsin, where 96 percent of the residents are white. "You live in poverty. Your schools are no good. You have no jobs. Fifty-eight percent of your youth is unemployed? What the hell do you have to lose?" At a campaign stop in Akron, Ohio, Monday night, Trump continued his appeals to African American voters. "Look, it is a disaster the way African Americans are living ... We'll get rid of the crime. You'll be able to walk down the street without getting shot." Brandon Berg, an African American pastor and an undecided Republican, attended Trump's rally in Akron. "He's got to take his arguments to the streets," he said. "Meet them where they are." Calvin Tucker, a 64-year-old from the northeastern city of Philadelphia, is the only African American Republican convention delegate from the state of Pennsylvania. He said Trump's message of entrepreneurship appeals to him. "We need a change agent," he said. "He's breaking down his overall economic platform and relating it to African Americans." Another African American Philadelphia resident, 43-year-old Foluke Bennett, views Trump differently, describing Trump's remarks about African Americans as "racist." 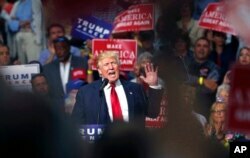 Campaign aides say Trump will indeed take his message to minorities in the coming weeks with trips being planned to urban areas and Latino communities, and the development of an empowerment plan that emphasizes education and wealth accumulation.